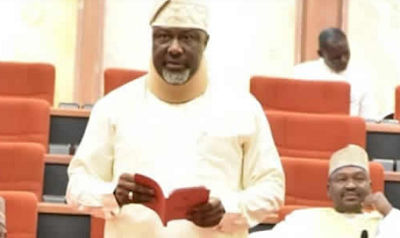 The lawmaker representing Kogi West Senatorial District, Senator Dino Melaye, maintained his seat at the Peoples Democratic Party section in the chamber. He relocated to the seat on Wednesday in spite of being a member of the All Progressives Congress. Melaye also raised a point of order to describe President Muhammadu Buhari’s recent comments on the National Assembly as against his personal privilege as a member. The President had penultimate Tuesday attacked the National Assembly members at the Presidential Villa, Abuja, while receiving members of the Buhari Support Organisation led by the Comptroller-General of the Nigeria Customs Service, Col. Hameed Ali (retd.). Melaye alleged that the President’s body language towards the National Assembly was the reason why the Inspector-General of Police, Ibrahim Idris, and heads of Ministries, Departments and Agencies often refused to answer invitations by the lawmakers. He described Buhari’s comments as derogatory and unparliamentary, asking the President to apologise to the National Assembly. Melaye said, “As a Senator of the Federal Republic of Nigeria who came to the National Assembly in 2007 – about 11 years ago, I am particularly unhappy and my privilege was abused by President Muhammadu Buhari last week. “Last week, the President, in the Villa, addressed the delegation of the Buhari Campaign Organisation, and this was televised on Channels TV. The President said he didn’t know what we were doing in the National Assembly. He said that some of us had been in the National Assembly for over 10 years and we had nothing to show for it.